FIVE UNITS OF Dublin Fire Brigade were called to tackle a large fire at the Ballymun shopping centre last night. A call came in at around 10.20pm that the roof of the building was on fire. Four pumps and a turntable ladder vehicle were sent to battle the blaze and fire crews remained at the scene until close to 12.30am this morning when they managed to bring it under control. The Dangerous Building unit was later called in to check the stability of the structure after the fire. The Ballymun Shopping Centre was previously owned by NAMA but was acquired by Dublin City Council and is due to be redeveloped. The council is now working to find new premises for the two remaining vendors. They were not affected by last night’s fire. Email “Fire crews battle massive blaze at Ballymun shopping centre ”. 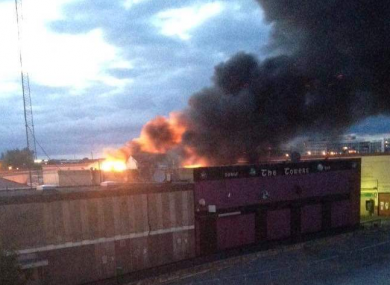 Feedback on “Fire crews battle massive blaze at Ballymun shopping centre ”.